"They weren't just nine guys in a boat; they were a crew." Considering that I'm not at all a sports person, it seems odd that I would even be reading a book about the University of Washington crew team. I didn't know what to expect, but after reading the first chapter I was totally hooked. It only got better from there. I don't often seek out inspiring reads, and I had no intention at all of buying/reading this book until one of my online reading friends (thank you, Trish!) wrote a review that made me want to run to the store to pick this one up. And I'm happy I did. It's probably a given that almost everyone is familiar with the fact that at the 1936 Olympic Games held in Berlin, Jesse Owens walked away with four gold medals, throwing the Nazi ideal of the Aryan supremacy right back in Hitler's face. Another thing about that year's Olympic games that most people are familiar with is the call for a boycott of the games, as rumors were circulating about what was really going on in Germany and the repressive measures of the Nazis. But it's very unlikely that anyone other than sports historians or people who are really into the history of the Olympic games know about the crew team from the University of Washington who literally battled the odds and not only made it to the games, but went on to win won the gold medal. 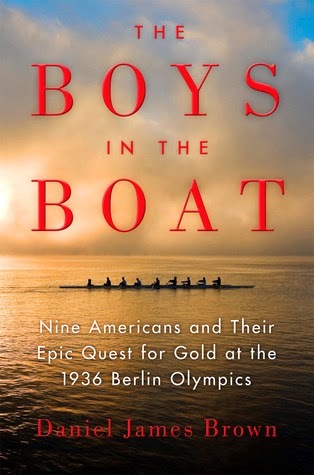 The Boys in the Boat not only takes the readers through the crew's efforts in getting there, but also goes into great depth about the crew members, especially the central figure in this book, Joe Rantz. His story lies at the heart of this book, but the author also includes stories about the other members of the team, a look at the Depression in the US, and what was going on in Germany at the time. He also examines the sport of crewing itself -- especially the prominence of the teams from elite Ivy League universities. As he notes, "the center of gravity in American collegiate rowing still lay somewhere between Cambridge, New Haven, Princeton, Ithaca, and Annapolis." Joe's story is the best part of this book. I've written more about this book on the nonfiction page of this reading journal blog, but the bottom line is that it's one I can recommend very highly, and a book that absolutely should not be missed.